Douglas Automotive has received multiple A-rate reports from Angie’s List members earning the total care automotive maintenance facility a coveted spot on the Angie’s List honor roll page. Popular business review website, Angie’s List, only recognizes the top rated service providers, deeming Douglas Automotive as one of the top total care automotive facilities in the area. To make the Angie’s List honor roll a business must earn multiple A-rate reports within a 60 day period and completely avoid negative D or F reports. The Better Business Bureau has just awarded Douglas Automotive a Complaint-Free award for the third year in a row! This is truly an honor as it helps reinforce the values we put into action each day for our clients and workplace. Douglas Automotive has been awarded Best of the Fox award recipient numerous times for the following categories: Best Auto Repair (Mechanical Facility) in McHenry County, One of the Best Muffler Shops, and One of the Best Oil Changes, which comes in addition to many other recognitions. We are truly grateful to all of those who voted and continue to support Douglas Automotive. We can help you avoid costly or unnecessary repairs through a regular program of preventive maintenance. We’ll outline the best plan for your vehicle based on the manufacturer’s specifications, and we’ll help you stay on schedule so you’ll have the peace of mind that comes with knowing your vehicle is in top condition. We’ll also maintain a comprehensive service history for your vehicle. When you take care of all your automotive needs with us, keeping your vehicle in peak condition will be less expensive—and more convenient. You may assume the best place to have your car serviced is at a dealer, since they sell your make and model. However, you’ll find that our ASE–certified technicians provide a higher level of service than most dealership mechanics. Not only do we know your vehicle inside and out, we have broader knowledge and experience and superior diagnostic skills, gained from years of servicing many different makes and models. And our state–of–the–art tools, equipment and information systems often surpass those at dealer service departments. By law, any certified shop can perform service without voiding your warranty. 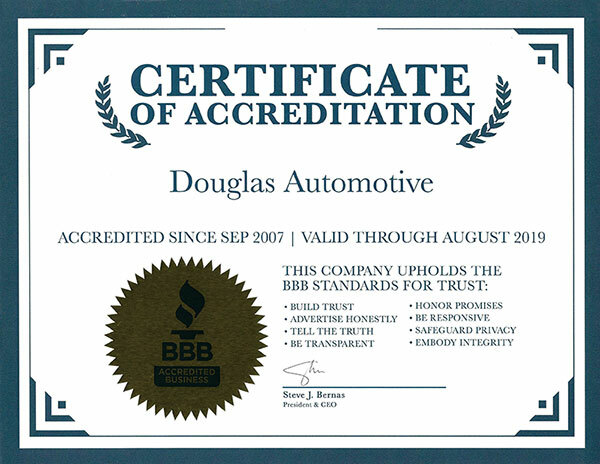 Douglas Automotive is fully certified and completely qualified to perform any service or maintenance on your car, and your factory warranty will remain intact. When you entrust your vehicle to us, you can rest easy knowing that you’ll receive the highest level of automotive care. Doug McAllister started his career in the auto service business running a full service Amoco station in Barrington, IL for 14 years. For the next five years, he was the Fleet Manager at Willow Creek Church where, in addition to maintaining their fleet of vehicles, he developed volunteer teams and established the CARS ministry, a program that has been successfully replicated across the nation. In 1993, Doug and his wife Janet decided to make a change and they opened Douglas Automotive in Barrington. Their goal was to provide excellent automotive service with steadfast integrity. Douglas Automotive grew rapidly in the first five years. So, Doug and Janet opened a second location in Crystal Lake. Douglas Automotive has been a part of the Northwest Suburban Business Community since 1984. They continue their active participation with the Better Business Bureau, and local Chambers of Commerce. In 2007, 2010, 2011, and 2012 Douglas Automotive received “Best of the Fox” recognition as the number one automotive repair destination in McHenry County.